Time to get your Banquet Tickets & Ad! 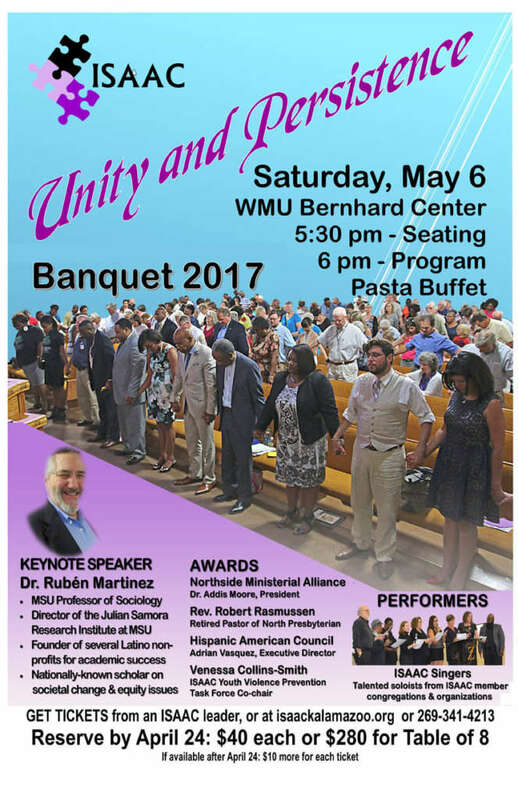 Tickets for the May 6 Banquet are now available from ISAAC leaders or by calling 269-341-4213. Tables at the Banquet will be “Beloved Community” seating—shared with another congregation or organization—unless you request otherwise. Dr. Martin Luther King, Jr. wrote, “Our goal is to create a beloved community and this will require a qualitative change in our souls as well as a quantitative change in our lives.” Sharing a table, and getting to know others who also support our work, is one step to help us get there! Ads for the banquet book are due by April 17. (After April 17, there may still be space in the book or your ad may be placed in the program insert.) Every ad is significant support for our work to create an equitable community. Who can you ask to place an ad? What business, agency, institution, community leader, organization or congregation do you have a connection with? Please ask them to place an ad! There are full color ads at many levels of sponsorship and black and white ads of all sizes. They can get the details from [email protected] or 269-341-4213. THANK YOU!